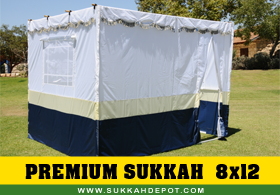 The premium sukkah is the flagship item of the EZ-Lock line and has a majestic 8′ height. This sukkah has a majestic 3 tone color combination with decorative tassels along the top, and a super size window. You can expand the sukkah by purchasing additional zipper corner fabtic from the line, then just add them to the existing walls. Note: Available in any size and features our exclusive 10 year warranty.